This being December, Zeba shared with me her Christmas recipe for marzipan bonbons. What she does is pour tempered chocolate in the mould to create a shell, fills it with home made marzipan and tops it with more chocolate. I decided to play around with the recipe a bit and created these marzipan apples instead. I must admit I am not a fan of marzipan. Commercial marzipan must be blamed here because it is overly sweet and lacks any kind of texture. 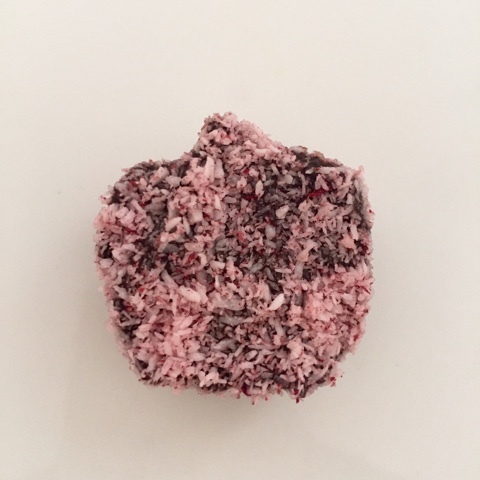 But Zeba's marzipan isn't too sweet and by rolling my chocolate dipped marzipan apples in pink hued coconut, I'm adding a layer of texture and another flavour that balances out the sweetness. I also divided Zeba's recipe by a fourth so this one makes about 20 marzipan apples. In a heavy bottomed saucepan, mix ground almonds, sugar, liquid glucose and water. Put on a slow heat and cook, stirring frequently, until the mixture is quite thick. Let cool. Lightly grease silicon moulds (apple or another shape). Press the marzipan into the moulds and chill in the fridge for 10 minutes. Take the marzipan out of the molds, arrange in a single layer in a parchment lined tray and let chill in the fridge for half an hour. In the meantime, make colored coconut. Put desiccated coconut in a bowl and add 2-3 drops of gel color. Mix with a fork until the coconut absorbs the color and is uniformly pink. If you want your apples to be rose red, add more color. Now temper your chocolate. Heat 1-2 inches of water in a saucepan. Bring to a boil, then reduce the heat to a simmer. Pop another bowl on top of the saucepan of simmering water, making sure it doesn't touch the water. I get my chocolate in small chips but chop yours finely if you have bars. This recipe doesn't need all 300 grams of chocolate but it is hard to temper anything less than that. Reserve 60 grams of chocolate and put the rest in the bowl of your makeshift double boiler. Stir until the chocolate melts completely. You are looking for the chocolate to get to about 120F. Take the bowl off the heat, making sure to wipe the condensation at its base. Add the remaining chocolate and stir until the temperature reduces to 82F. Put the chocolate back on top of simmering water and heat back to 90-91F. Your chocolate is now in temper. One by one, put the marzipan apples on a fork and dip in tempered chocolate. Shake to remove excess chocolate and drop into the bowl of coconut to coat. Remove to a parchment lined baking sheet. Once all the apples are dipped, pop the baking sheet into the freezer for 15 minutes for the chocolate to set. You will be left with some tempered chocolate. Just pour it into moulds to create solid chocolates or wait until the next post to find out what I did with mine.